From £58pp for the full tea stand and a cocktail 'flight'. CC security require for groups of 4+. Please note that this offer has an age restriction of 21 and over. Join celebrate 50th Anniversary of Laurent-Perrier Cuvée Rosé Champagne and enjoy the renowned Mad Hatters Afternoon Tea with a Cuvée Rosé twist. 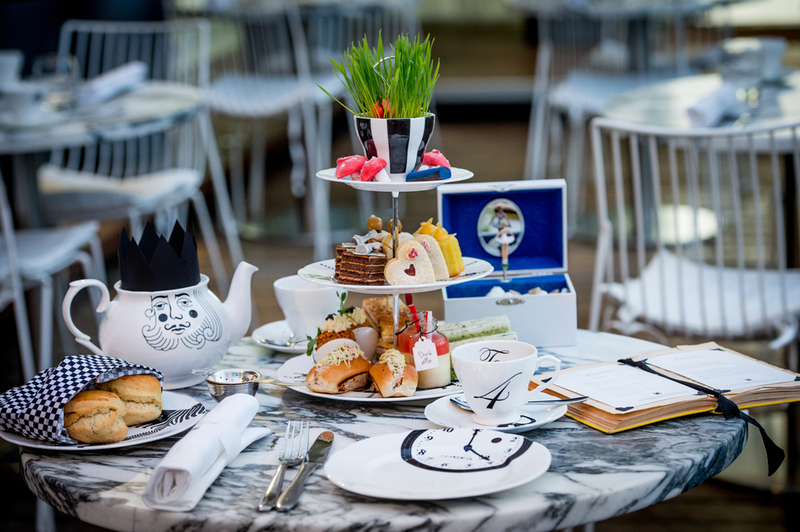 Sanderson Hotel gives visitors the chance to climb down a rabbit hole and explore the wonderland beneath at their Mad Hatter's Afternoon Tea. Creating a twisted version of the traditional British afternoon tea, menus are hidden inside vintage books and napkins are wrapped with riddles, while teapots adorned with kings and queens and sandwich plates featuring birdcages, carousels and ticking clocks play host to wondrous fare. Re-launched in 2015 to celebrate the 150th anniversary of Lewis Carroll's Alice's Adventures in Wonderland, the menu is a heady mix of colourful savoury dishes and striking sweets. Offering something more than just finger sandwiches, the savoury options include a crab éclair and a croque-monsier, while traditional flavours still feature with a smoked salmon and caviar scotch egg and a cucumber and cream cheese sandwich on fresh lime bread. Each of the sweets are beautifully intricate, with every aspect carefully constructed and perfectly matched with the Alice in Wonderland theme - the menu took four months to finalise and the level of detail is apparent. From the red velvet ladybird and blue caterpillar to the Queen of Hearts Oreo cookie soldier and magic marshmallow mushrooms, each addition tastes as good as it looks. Scones are light, delicious and generously portioned, the themed teas perfectly balanced, and the Alice drink me potion a refreshing conclusion. It's all gloriously bonkers. Mad Hatter's Afternoon Tea, Sanderson Hotel gyms, sporting activities, health & beauty and fitness. The best pubs near London Mad Hatter's Afternoon Tea, Sanderson Hotel. Mad Hatter's Afternoon Tea, Sanderson Hotel clubs, bars, cabaret nights, casinos and interesting nightlife. Where to have your meeting, conference, exhibition, private dining or training course near Mad Hatter's Afternoon Tea, Sanderson Hotel. From cheap budget accommodation to luxury 5 star hotels see our deals for Mad Hatter's Afternoon Tea, Sanderson Hotel hotels, including Sanderson, A Morgans Hotel from 0% off.